Hello from Yuka from Ichiroya. Obon is coming soon and we too have obon holidays. The Obon holiday traditionally is to welcome ancestors' spirit on August 13th and send them back on the 16th. Many people go back to their home town and most companies close during obon time. During our holidays, no new items will be listed, and we won't be able to reply to any emails or process shipments. Thank you so much for your understanding and consideration. 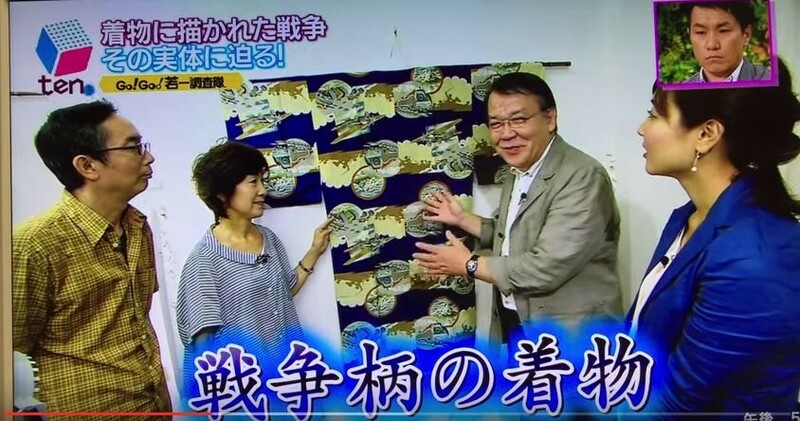 Last month, Yomiuri TV (Local TV broadcasting Kansai, west Japan area) came to our office for the program to show `war motif kimono' on location. 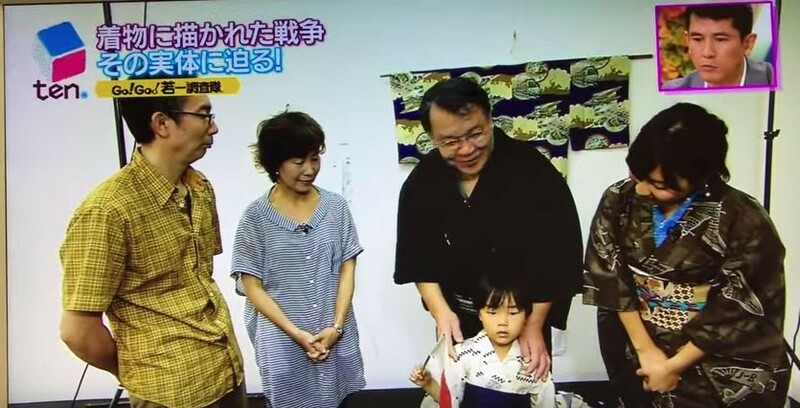 Koji Wakaichi is (on the left) is a writer and commentator, who found our website and wanted to show those kimono in his corner in August as part of the program of the 70th anniversary of the end of WWII. The whole program is a two hour variety news program which includes news, weather report, cooking corner, small topics from town and so on. 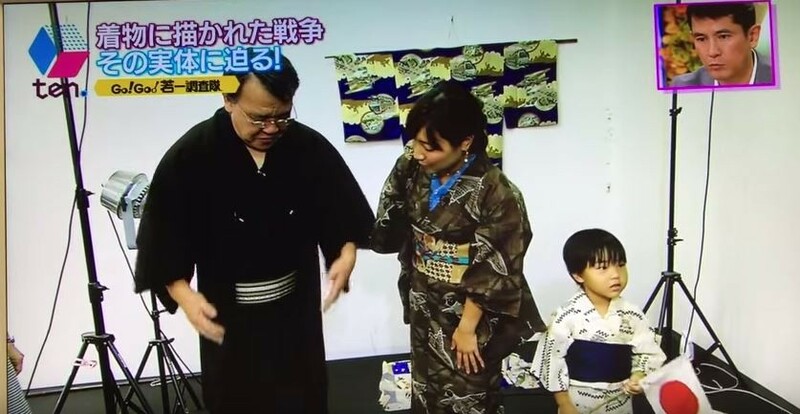 This time he wanted to approach ordinary people's life through war motif kimono. We showed some kimono including men's haori with famous General Togo in the lining and a rare women's obi with Bakudan Sanyushi motif(the Three Human Bullets)and also kimono with fighters. As the real witness of war are getting older, the memory of those kimono are dissappearing and forgotten. It may sound surprising but most Japanese do not know the existence of these kimono. We found many war motif kimon through kimono auctions, but when we saw them first time, it was quite shocking. Some of our customers from abroad thought they are valuable as both historical document and also as art and we asked one of our customer to be in this corner ( we interviewed her on skype). Through the preparation and the location with TV people, we recognized these kimono were almost `forgotten' kimono. They were planning to wear these kimono and going to the city to see the reaction of ordinary people but it was a rainy day and they had to give up that plan. We dressed them in these kimono. 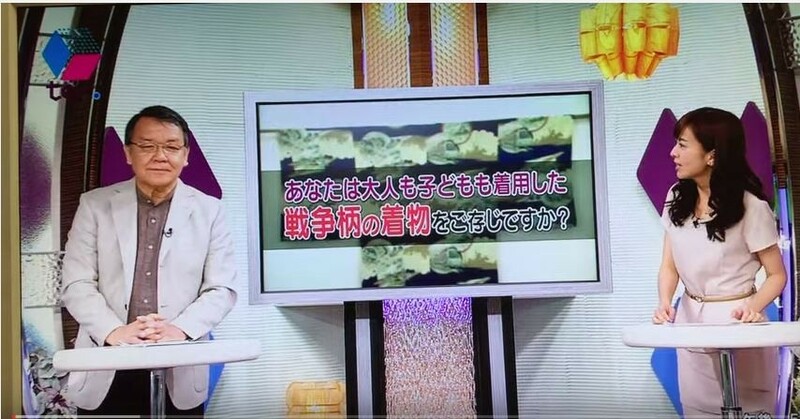 There seem very few people in Japan who are interested in these kimono and Prof. Inui (she seems the only one person who is doing research on this topic) who was also in that corner commented, that these war motif kimono are not from Government as a propaganda but they were made because these patterns were popular among people. She analyzed that merchants in Osaka made these kimono because they found them as a business chance during the Sino-Japanese War. 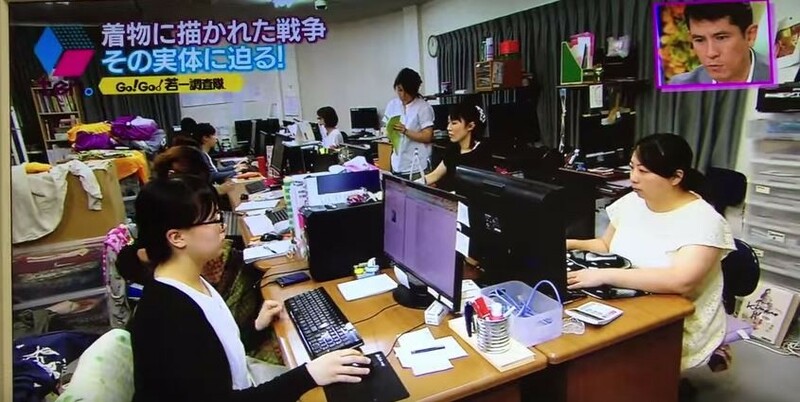 They also filmed our office-maybe you met on the net with some of our staff in the photo. It was really our first time experience to be in TV program, and the corner became a very different one from what we expected, to be honest. We knew they would edit but were not aware that they put so many things in that short corner. However, we were glad many people could see these kimono from special era. Wakaichi san said, fashion always reflects the time, and even war can be fashion. Imagine little boys wearing these kimono, for them soldiers must have looked cool and like a hero of present anime. We are glad Wakaichi san this topc in his corner. Even though the corner was short, we think it became a nice opportunity to show the existence of these kimono from war time to Japanese.